Transformers is back, back, back again just as we knew them to be in the 80's... sans the heartbreak of watching all your beloved characters meet an untimely end in the first twelve minutes. Spoiler alert? 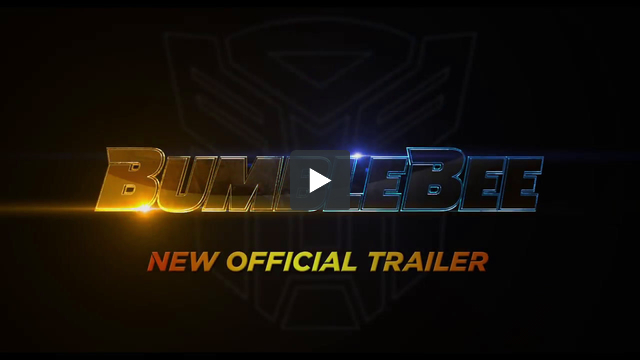 This time around, everyone's favorite scrappy stinger, Bumblebee, steps up to the plate for his own title movie with a blast of 80's nostalgia and Michael Bay franchise references that will appeal to every generation of Transformers fan, and ring in the new ones. After eyeing a slow start at the box office it's first week, Bumblebee climbed his way through the charts and proved that when it comes to making dollars, Optimus Prime isn't the only one who's got the touch. Opening just prior to Christmas, the small Autobot went up against box office behemoth's with Disney's Mary Poppins Returns, which tipped their hats at a $23,523,121 opening weekend, and the highly anticipated Warner Brothers flick, Aquaman - who recently broke the $1 Billion mark in worldwide sales. Fear not, Autobot, Bumblebee is doing just fine, and in fact has exceeded expectations with current earnings of $438,541,152 worldwide, and still going. On a mission given by Optimus Prime, Bumblebee finds himself on Earth in 1987, where the scrappy stinger takes finds refuge at a junkyard in a small Californian beach town. Charlie, on the cusp of turning 18 and trying to find her place in the world, discovers Bumblebee, battle-scarred and broken. With Decepticons, Shatter and Dropkick hot on his tail, and Agent Burns set to capture the unknown alien robot, Bumblebee and Charlie set off on an adventure of a life time, with a rocking playlist to boot. Taking the baton this time around is director Travis Knight (Kubo and the Two Strings), alongside Transformers newcomers to the cast with Hailee Steinfeld (The Edge of Seventeen) as Bumblebee's human counterpart, Charlie, John Cena (Trainwreck) as Agent Burns, and Jorge Lendeborg Jr. (Love, Simon) as Memo. In the recording booth to reprise his infamous role as Optimus Prime, Peter Cullen returned to the cast, along with Angela Bassett as Decepticon newcomer, Shatter, and Dylan O'Brien (Teen Wolf). So, what brands decided to join our young heroes this time around for creative collaborations? We have you covered! 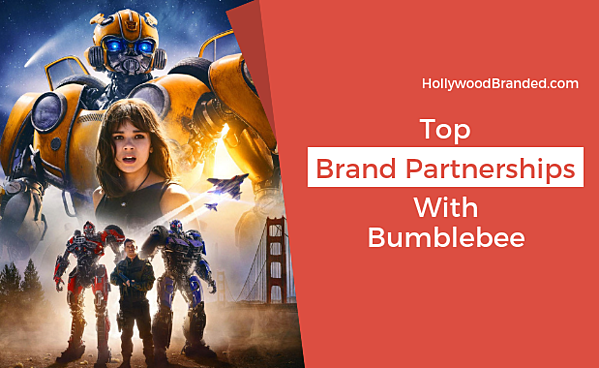 Without further ado, we bring you the brands that were definitely buzz worthy when it came to partnering with Bumblebee. First on our list comes a likely, though still unique and creative team up between AMC Theaters and Paramount pictures in promotion of the theatrical release of Bumblebee. The promotion consisted of an online sweepstakes where the winner earned a four day/three night Ultimate Hollywood Experience to Universal Studios Hollywood Park and Paramount Studios. 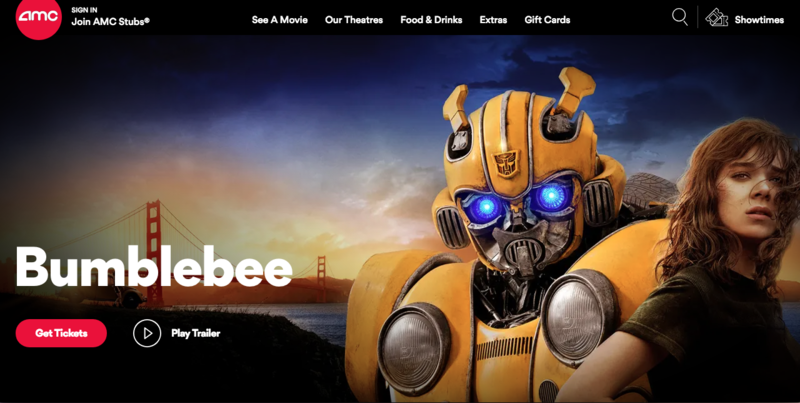 For entry to the AMC Theatres Sweepstakes, participants visited the online page for registration and purchase of a Bumblebee ticket using their AMC Stubs Membership Number or Account. The sweepstakes ran from November 21, 2018 and ended on December 19, 2018, just ahead of the film's release. Entries were limited to one per person regardless of entry method. On January 4, 2019, a winner was randomly selected to win the prize! 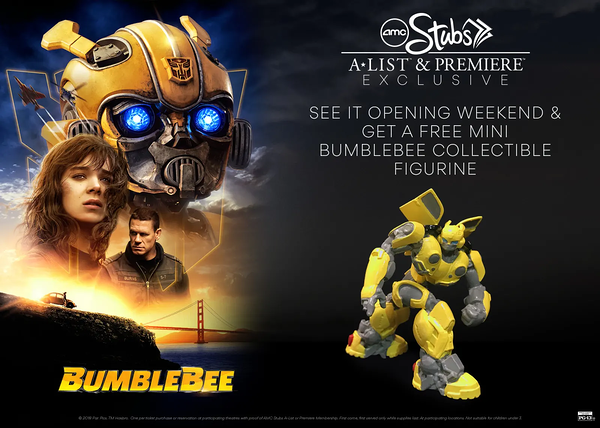 As a special bonus, the partnership allowed AMC Stubs A-Listers and Premiere members to see the film on opening weekend, and take home a mini collectible Bumblebee figurine. For some international flare, Paramount pictures collaborated with Baidu, which is the top Chinese-language internet search provider, in promotion for the film. Together, Baidu and the Paramount International Digital group worked closely to bring the beloved yellow Autobot to his new home within Baidu’s keyboard apps in such markets as the United States, China, and Japan. The Simeji, Facemoji, and Baidu IME keyboards were already widely known for their extensive libraries of emojis, keyboard skins, and customizable themes, along with their massive communities of creators; with the partnership, the nearly 400 million users could download exclusive Bumblebee-themed offers in-app. 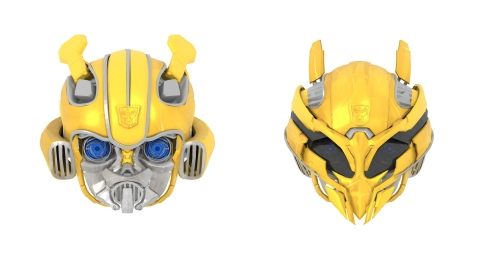 The Bumblebee AR emojis were primarily built on using Baidu’s sophisticated face-tracking AI, and created the hyper-realistic AR rendering of Bumblebee himself! Bumblebee mirrored the user’s expressions, and had a built in incentive to take selfies or create unique GIFs to share in the app. 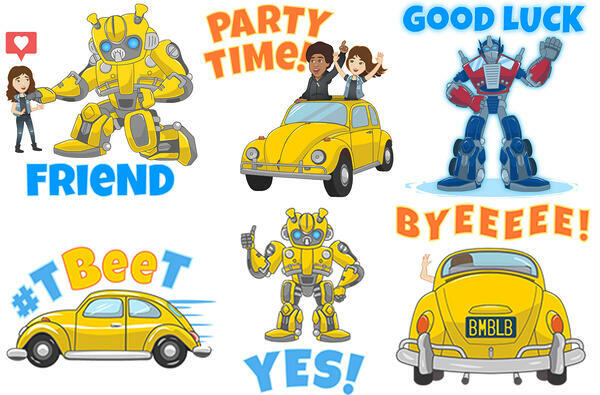 Expressive stickers featuring Bumblebee, Charlie and even Optimus Prime made conversations sweeter than honey with sayings like “Bee right there” “#TBeeT,” “High Five!” and others. In addition to the Bumblebee-inspired sticker sets and AR emojis, users had the opportunity to interact with other Transformers fans in the app by voting on their favorite sticker combinations, not to mention downloading them as well. 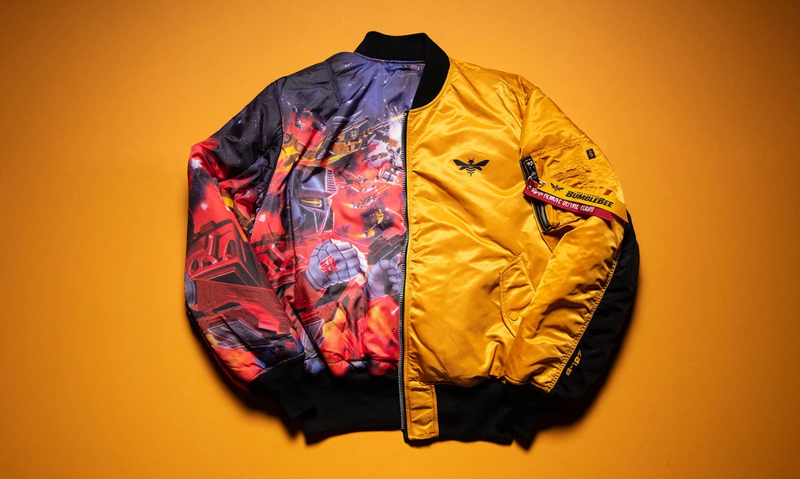 For fans who want to represent their Bumblebee love through apparel, Alpha Industries joined forces with Paramount for a reworked MA-1 flight jacket celebrating the theatrical release of the film. Sporting a Bumblebee-inspired yellow shell, the limited edition flight jacket touts an embroidered Bumblebee logo at the chest and referential zipper pulled to cement the inspiration. But there's more than meets the eye with this jacket. On the inside? A reversible pattern in a colorful print showcasing the Autobots and Decepticons locked in the heat of battle. Two other designs are set to release in 2019 and can be found on Alpha Industries website. And the best news? Free shipping on all domestic orders, so get yours now! Looking For Some Buzz Around Your Brand? Want to keep learning about the inventive ways brands have been able to partner with Hollywood's latest and greatest on the silver screen? Check out some other blog posts we've written about other brand partnerships and how they impacted brands! One thing that is unique about our agency is that we are absolutely transparent about our knowledge from years of successful campaigns and are always happy to share. If you want to learn more information about the cost of entertainment marketing, download our free pricing guide now to help better prepare your brand for an entertainment marketing campaign!